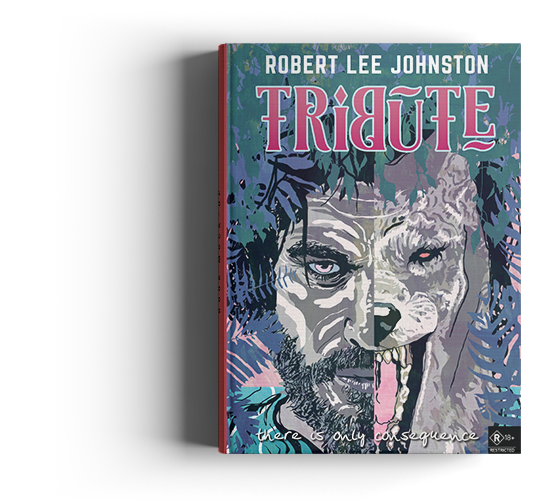 Robert Lee Johnston is an Australian author based in Far North Queensland. Robert enjoys writing challenging, villainous characters and subjects. He loves the Australian humour, in good or poor taste, that is born from those places of darkness. It is his belief that the deeper, more painful the situation, the funnier and better Aussies become. Australia is a nation of fair fighters, with a proud sense of humour and humility. That combination is unique and rare and continues to inspire and supply him with many characters, brawlers, squealers, pelicans, cowards, galahs, absolute bloody champions and the down-trodden to choose from. Tribute is a small, Australian township blessed with ancient mountainous rainforest, waterfalls, clean pristine rivers and a filthy secret. Six young lives are brought together by a church orphanage as wards of the state then groomed and sold off at a tender age. Other than the jungle, their only comfort is each other, and Stirrup, a brave blue cattle dog. The only family they have ever known. The twenty-first century has a visitor. He visits earth for one year each century. On arrival, he is stripped of his power. The devil is one of us, among us. Lucifer is on leave. And he's here, in Australia.